A life-sized, life-like Fimo clay Polo Mint and a hand painted Sterling Silver 1st Rosette feature in this Sweet Success Necklace. The Polo Mint and rosette hang from a modern 1.5mm wide Sterling Silver Ball Chain which is available in a range of sizes from 14" to 18". 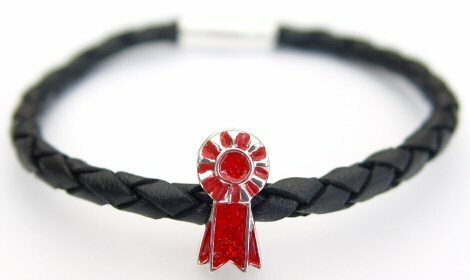 This is an ideal gift to celebrate that special win or that unique bond between horse and rider. WARNING: The pendant is not edible and must not be mistaken for food. It is a choking hazard and must be kept away from children under 14 years at all times. 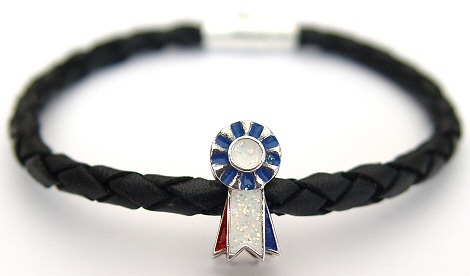 Champions Rosette Bracelet: Sterling Silver Red, White & Blue Champions Rosette bead on a black, braided, real leather bracelet.